Transcom Instruments’ SpecMini is an Android-based, handheld spectrum analyser featuring high testing sensitivity, light weight, compact size and portable design. Its performance characteristics meet the testing and measurement requirements of the majority of RF signals. 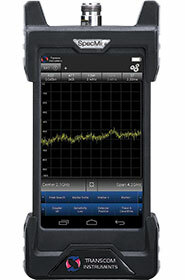 The instrument’s Android operating system and high-resolution, multi-touchscreen allow for user-friendly testing and measurement of signals across the frequency range of 1 MHz to 6 GHz. Features include general spectrum test, occupied bandwidth test, channel power measurement, adjacent channel leakage power ratio measurement, and interference search. The SpecMini measures 200 x 96 x 67 mm and weighs 1,25 kg (including the battery).